Sometimes it just has to go cardamom in my kitchen. I start dreaming about flavour swaps and find my hands magically clutching a baggie of army-green pods from that crazy mishmash called my spice drawer. I hold the bag and … sigh. No, I start cussing, wondering aloud if I have the cooking mojo in me to ferret out their cache. Will my cold, stiff fingers find the fortitude to single out each and every one of these tiny seeds that bear an uncanny resemblance to mouse turds? Cardamom pods aren’t like those happy, smiling pistachio nuts, each cracked and cooperative. These babies are sealed shut like an exotic, perfumed temptress. Thus, they bring out the pounder in me. I’ve tried crushing them under my chef’s knife like garlic cloves – but lo, they slide and slither. I’ve grabbed a sheet of wax paper and hammered a rolling pin over them a few times, to absolutely no avail, except for a heap of shredded wax paper. Luckily, an adorable silver mortar and pestle comes to my rescue. I throw a handful of pods in the bowl and happily clunk the silver pestle down until I hear crunch after satisfying crunch, splitting and cracking, dispersing their wealth. The very first pod reaps a clump of tar-black seeds. I can hear my East Indian cooking teacher intoning “Only the black ones are good” as I crack open pod after pod that she’d obviously throw out. A sliver fuzzy membrane is scattered among my largely brown, verging on beige collection. I drop it all into my spice grinder and grimace, again, because fifteen minutes of finicky fine motor work hasn’t even covered my spice grinder’s blade! Despite this ominous beginning, the seeds whirl into a satisfying silvery and soft powder that trails up into my waiting nostrils with an explosion of menthol and sweet, peppery perfume that is unmistakably cardamom. Why don’t I just throw up a white flag and buy it ground? Because I want flavour. Whole spices that are crushed or ground right before use, release essential oils full of oomph. And oomph is what I have planned for this special little biscotti packed with toasted almonds and pumpkin seeds, filled with organic flours, eggs, sugar and vanilla then made perfect thanks to cardamom in the batter. I finish each and every log of biscotti dough with a sparkle of cardamom sugar. Just a pinch will do it. I really can’t live in a house without biscotti. They are my go-to cookie and a welcome gift to friends and family . Thanks to the double bake, they store for weeks, even months in a closed glass container and travel well on airplanes and road trips. To toast almonds, arrange on a baking sheet and bake for 5 minutes. Add pumpkin seeds to the sheet and bake another 5 minutes. Allow nuts and seeds to cool completely. In a large bowl, combine flours, sugar, baking powder, cardamom and salt. Use a whisk to mix thoroughly. Whisk eggs and vanilla in bowl of an electric mixer until frothy. Use the paddle attachment to mix in flour and sugar mixture. As soon as the dough clumps around the paddle, add toasted almonds and pumpkin seeds and mix until just combined. Dust countertop with flour. Line two large baking sheets with parchment paper. Spoon out one quarter of the sticky dough, dust lightly with flour and working quickly, roll into a 8-10 inch log. Transfer log to baking sheet. Repeat 3 times. In a small bowl, mix sugar and cardamom. Sprinkle over logs with pinched fingers. Bake for 30 minutes or until biscotti logs are golden and firm. Completely cool logs on a rack for at least 30 min. Using a serrated knife, cut crosswise into 3/4 inch wide slices. Arrange cut side down on baking sheets and return to 350 oven for 10-15 minutes or until golden-brown and crisp. When I tasted my first bran muffin at the corner of College and Bathurst at The Mars, it was a revelation. I was 19, wore a peasant skirt over Kodiak boots and rolled my own cigarettes with Drum tobacco. I thought myself street-wise but was anything but … Just incredibly curious and always, always hungry. Thus, that first ravenous bite into a Mars bran muffin – dark with molasses and dense like black forest cake – is pure gold in my food memory bank. My boyfriend Bob was also a revelation. Nothing about him resembled where I came from. He hadn’t grown up in North Toronto or gone to Upper Canada College (like my brother, father or grandfather) but he sure knew enough about betting to pique my father’s gambling instincts and instill a gin rummy playing camaraderie between them. One summer evening at a family cottage dinner, my stately grandmother innocently asked “And what is it that you do, my dear?” while passing Bob the gravy boat. “I’m a bookie,” chirped Bob grinning like a cherub, thrilled to make this reveal. Nonnie promptly cleared her throat and my grandfather mumbled “Holy sailor” but no one else asked another word, quickly sweeping this unpleasant news under the nearest carpet. But back to the muffin. The Mars muffin. It was big, filling and dotted with plump, fat raisins. They were served hot from the oven, sliced in half with a large pat of cold butter wedged inside and fully melted in seconds. Diners, breakfast eggs, take-out baklava and percolated coffee played large in my coming of culinary age. These gigantic muffins were new to diners in the 70s and customers would line up in front of the cash register hoping to leave with half a dozen of these towering –no, glistening – babies stuffed inside a Mars embossed, white cardboard box. Near that same cash register, along the long, white Formica diner bar, were stools occupied by inner-city characters of dubious distinction. Bob seemed to know them all. They had nicknames like Baldy, Joe the Dipper or Car Fare. Some came “packing” and others had Mafia affiliations following them like shadows. Bob, being Bob, liked to break away pieces of my W.A.S.P. veneer by unexpectedly pushing me in front of one of these cigar smoking men at the Mars saying, “Hey Dukey, meet my girlfriend Lynn. She’s a Haver-girl.” I seethed at these embarrassments… but they didn’t stop me from moving to New York with Bob a year later and attending an Ivy League college while he worked as a bouncer at Studio 54. But back to the muffins. I made some today in my West coast kitchen as the rain pelted across a gray, foggy horizon in a day-long deluge. I searched through my baking boxes and pulled out a bag of wheat bran, which now looks oddly old school next to newer fibrous fads like chia, flax or hemp. I found some spelt which adds such friendly nuttiness to any baking equation. I mixed the dry and wet ingredients in two separate bowls. Quick breads and muffins all like this preparatory segregation with just minimal combining prior to the bake. Crosby’s molasses is a necessary must if you want real tasting bran muffins. And remember to measure the oil in the measuring cup first as prep for the molasses, which will slide out of the measuring cup effortlessly if you do. Unlike the Mars bran muffin, these ones are good for you: moist, satisfying and rich. I’m willing to place a double-or-nothing bet on Crisco as the trans-fat source of those yesteryear muffins. Yet still, I savour that muffin’s nostalgia and happily munched on all these memories when creating, baking and eating my latest version. Healthy, fibre-full muffins with a rich, moist texture and just a hint of banana or apple flavour. Mix dry and wet ingredients separately in large bowl. Combine until just mixed. Use a ¼ cup measure to dollop into large paper muffin cups. Bake 20 minutes. Makes 12 large muffins. Every January, fresh vegetables finally get the attention they deserve. My beet buddies, whether they have billowing green leaves, long tapered roots or roly-poly bodies, are finally back in vogue! All it took was the excess of the holidays to help nudge all those colours and shapes back into the healthy eating spotlight. While I don’t like to play favourites, beets make me particularly happy, appealing not just to my palate, but my parsimonious nature. Where else do you get two vegetables for the price of one? 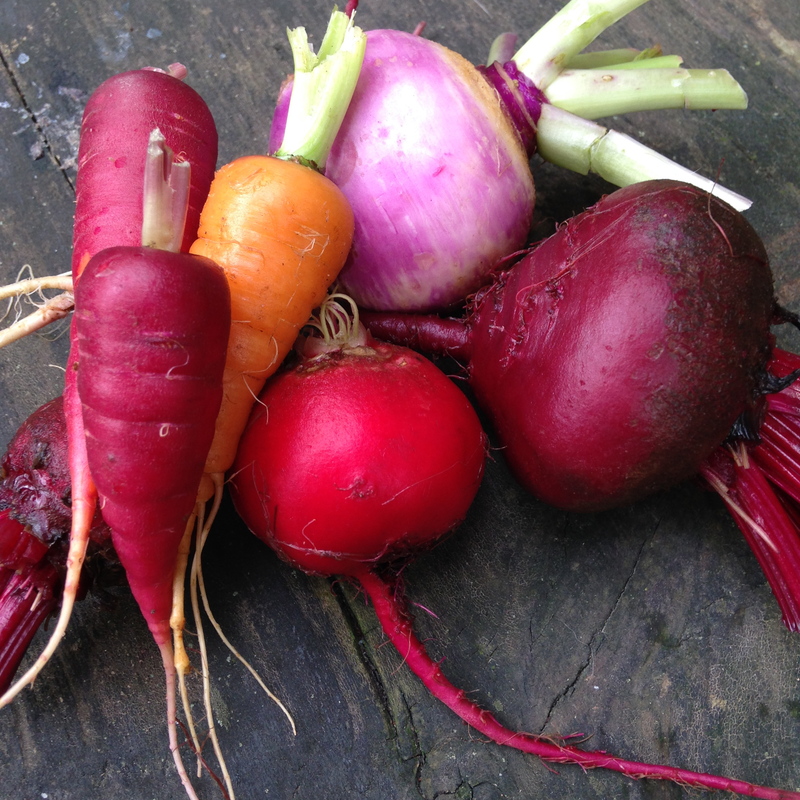 But the redness factor in beets – both in the roots and the greens – can distract. 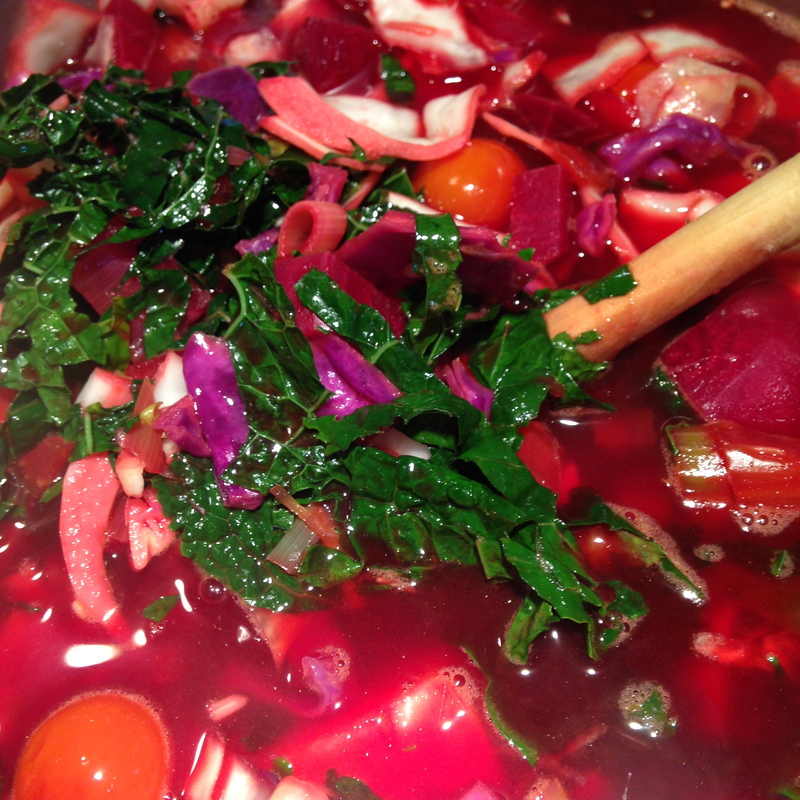 Not everyone can abide by the faint red juice that accompanies a sauté of beet greens and garlic. And even I, vegetable lover that I am, almost fainted when presented with a crimson bowl of borscht at the age of 13 while visiting the home of a classmate. Barely over the shock of my girlfriend’s father wearing an apron and cooking the soup from scratch, I followed her serving suggestion and placed a dollop of sour cream in the middle of what looked like a pool of blood. When I swirled the two together, I had visions of Pepto-Bismol and wondered if anyone would notice if my soup went stealthfully, spoon by spoon, into the African violet on the ledge behind me? My children, now in their 20s, still won’t go near a beet. Who cares?! I’m tickled to reap more of my share of beet rewards. Besides, these babies take time. 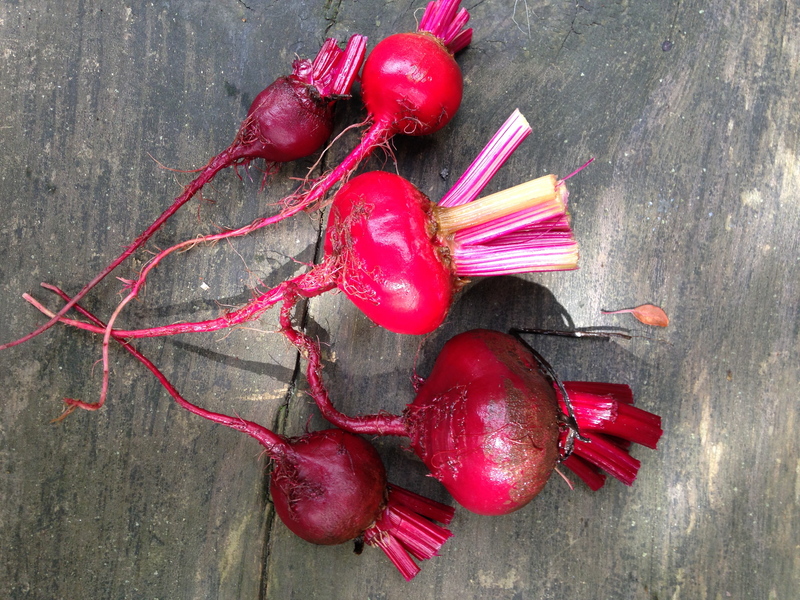 To roast, simply wrap unpeeled, individual beets in foil and bake at 350 F for an hour or until tender. Or boil unpeeled roots in salted water for 45 min (or until a knife slips through the flesh with no resistance). Once cooled in an ice-bath, a beet’s skin slips off effortlessly. There’s a reason you’ll find vacuum-packed, cooked beets sold in most European markets and in some upscale Toronto ones, too. Once cooked, you can slice them into a zillion different salad combinations. But if time is of the essence, peel a raw beet and pull out the box-grater. Shredded (or even spiralized) raw beets are a delicious addition to salads or can be sautéed in olive oil with seasonings such as ginger, shallots, garlic or lemon zest. Citrus is a fine companion for beets both visually and texturally. Think finely sliced grapefruit rounds stacked with cooked, sliced beets bathed in a piquant dressing with chives. Another winner is goat cheese. 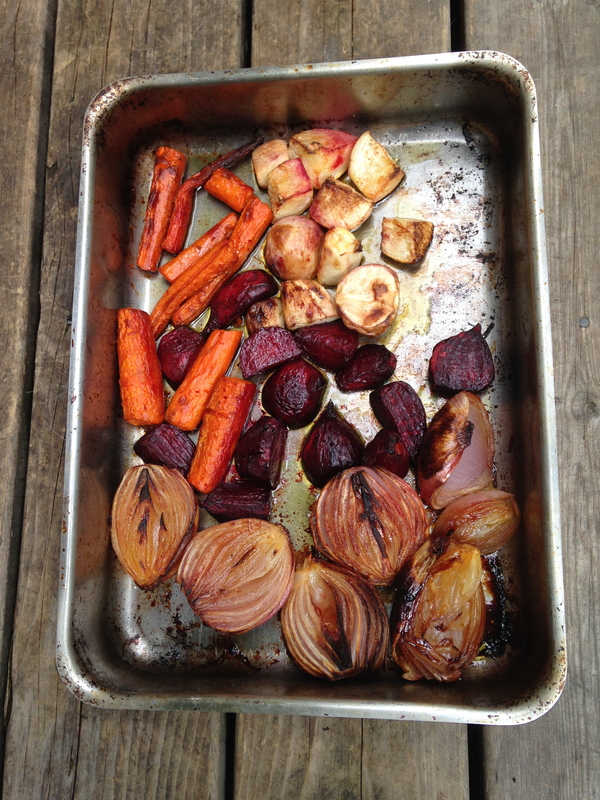 Try roasting peeled beet wedges, cippolline onions and whole garlic cloves in olive oil and salt at 400 F for 45 min. Toss warm with goat cheese, arugula and torn basil, dress with olive oil and a small splash of sherry vinegar and serve to your best, beet-loving friends – year round. This soup feeds an army. I like to serve it fresh (ideally the day after, since the flavours intensify) and freeze the rest. A dollop of dairy such as sour cream or plain Greek yogurt, sprinkled with chives or chopped green onions and chili flakes is an irresistible garnish.